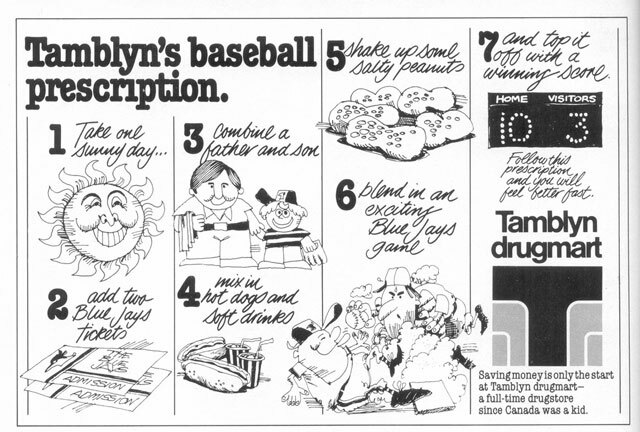 As a public service to fans planning to catch the Blue Jays’ home opener on Monday night, we offer a prescription for enjoying the game from the team’s debut season. Given the current weather, will the 30th anniversary opener be as snowy as the first? You can debate whether Canada was still a child when Gordon Tamblyn purchased a drug store at Queen St. E. and Lee Ave in 1904. By the early 1930s, the chain had grown to nearly 60 stores, mostly in Toronto, where the companied relied on a fleet of bicycle couriers for deliveries. The company was later purchased by Loblaws, whose hand is evident in the design of the Tamblyn logo. The company wouldn’t write prescriptions for much longer, as it was sold to British drug store giant Boots within two years of this ad. Several sales and name changes later, the stores evolved into the Rexall Pharma Plus chain.